It’s offical – Captain EO returns to Disneyland Paris on the 12 June. The official Disney Parks Blog has given confirmation for the return of Captain EO to Disneyland Paris. 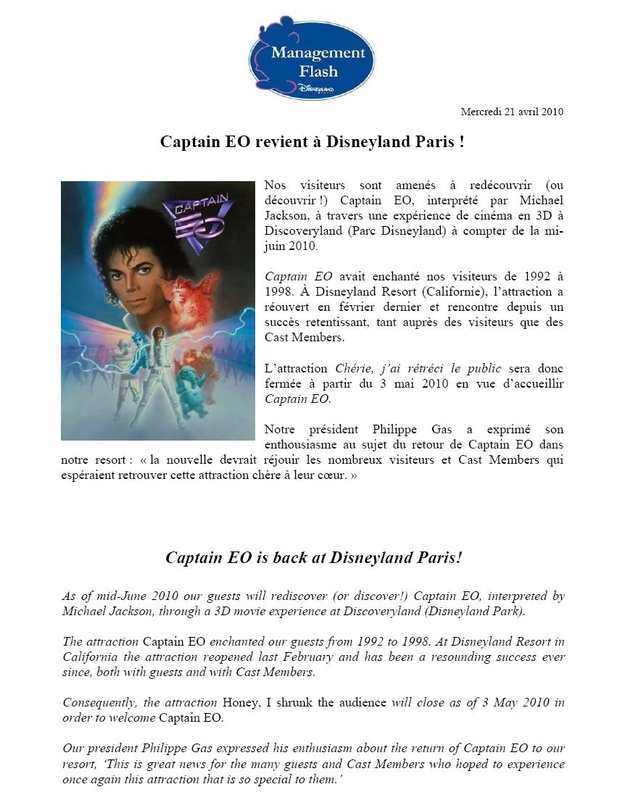 After weeks of rumours by park Cast Members and a leaked internal memo it has been officaly confrimed that Captain EO the 3D movie starting Michael Jackson will return to Disneyland Paris on 12 June. The TEA (Themed Entertainment Association) has released their rankings and attendance figures for 2009. The report covers all theme parks world wide. Again Disneyland Paris is listed as the fourth most visited theme park in the world with 12,740,000 visitors up 0.4% from 2008 when it had 12,688,000 visitors. Walt Dinsey Studios is listed as 8th in Europe for 2009 with 2,655,000 visitors up 1.6% from 2008 when 2,612,000 visitors visited the park. Here is the list of the top 10 theme parks world wide. Here are the top 20 visitor numbers for theme parks in Europe. Captain EO is coming back! The rumours about the return of Captain EO to Disneyland Paris appear to be true! As I reported on the 11 April 2010 Honey, I Shrunk the Audience will close on the 3rd May and as of mid-June 2010 Michael Jackson’s Captain EO will return to Discoveryland. Here is a copy of the DLP Management Flash dated 21 April from the DLRP Fan Blog. Disney Wonder through the magic of tilt-shift photography. Enjoy the Disney Wonder cruise ship through the magic of tilt-shift photography. Join the celebration as 65 of Disney’s unforgettable characters, from 18 beloved stories come to life this year as Disney On Ice celebrates 100 Years of Magic! This years ice show features Mickey Mouse, the irresistible Minnie Mouse, Goofy, Donald Duck, Jiminy Cricket, Pinocchio and all the Disney Princesses. 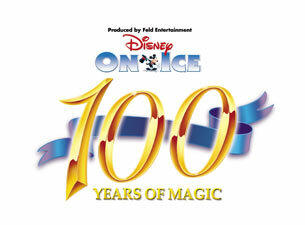 Guests will be thrilled by exciting moments from The Lion King; Mulan; and Disney/Pixar’s Finding Nemo, The Incredibles, and Toy Story films; in a skating spectacular filled with magical Disney moments you’ll remember forever as Disney On Ice celebrates 100 Years of Magic! Tickets for the shows are availble from Ticketmaster. Captain EO set course for July 2010 return? Rumours of a return of Michael Jackson’s Captain EO to Disneyland Paris have surfaced on the Disneyland Central Plaza forum from a Cast Member that works on the Buzz Lightyear and Orbitron rides. The rumours are that Honey I shrunk the Audience is closing at the end of April and Captain EO is making a return to the theatre from July 2010 for a one year run. Former Disney Imagineer Tim Delaney mentioned the possible return of Captian EO in an interview he did for the Season Pass Podcast a few weeks ago. 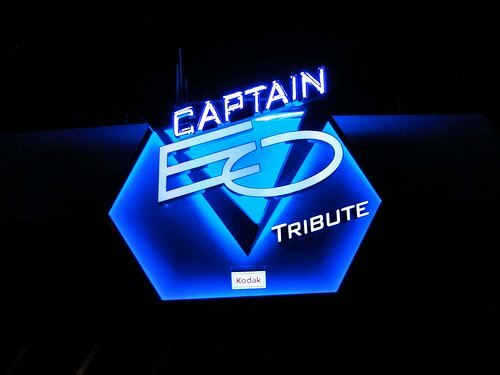 The attraction now entitled Captain EO Tribute re-opened at Disneyland park in Anaheim, California on 23 February 2010 and it’s return has been a huge success. After the death of Michael Jackson on 25 June 2009, Captain EO regained popularity on the Internet. For several years, fans had petitioned Disney to bring back the attraction and Jackson’s death had brought this campaign to a peak. Soon afterward, Disney officials were seen in Disneyland Anaheim at the Magic Eye Theater and reportedly held a private screening of Captain EO to determine if it could be shown again. On 18 December 2009 it was announced that Captain EO would return to Tomorrowland at Disneyland in Anaheim beginning in February 2010. Social and Print Media Manager Heather Hust Rivera from Disneyland Resorts confirmed this on the DisneyParks Blog and stated that Honey, I Shrunk the Audience! would be closing. Honey, I Shrunk the Audience hosted its final public showing in the Anaheim Magic Eye Theater (Now named the Tomorrowland Theater) at midnight on 4 January 2010 to make way for the Michael Jackson film’s return. It is reported that Captain EO will return to Tokyo Disneyland in the near future. Disneyland Paris steps into the 21st Century. Disneyland Paris has stepped in the 21st Century and has discovered Facebook, Twitter and YouTube.